On December 17, 1903, two brothers from Dayton, Ohio took their latest flying machine for test flights off the coast of North Carolina. With several witnesses looking on, this experiment became the first successful and fully-verified attempt to fly a controlled, powered, heavier-than-air airplane. Their names, Wilbur and Orville Wright, were placed at the forefront of flight history. The Wrights would remain secretive about their achievement, seeking legal protection for their accomplishments before officially publicizing their methods for successful flight. Meanwhile, other flight-minded inventors like Glenn H. Curtiss and Alberto Santos-Dumont continued to work in an effort to take to the skies on their own. Contemporaneously, these people began to achieve the same results as the Wrights, with even more advanced results in some cases. Profit and prestige through demonstration flights, competitions and other money-making ventures followed. However, by 1906 the Wrights patent had also come through, opening a path for legal action toward any aviator infringing on their workwhich, if interpreted broadly, would include anyone trying to make a mark in the aviation industry. Advertisement for a flight demonstration by leading Wright brothers rival, Glenn Curtiss (The Holt County Sentinel, 10 December 1909, 3). This was considered an infringement on the Wrights’ patent. The so-called patent wars between the Wrights and their competitors, especially Glenn H. Curtiss, played a major role in the lack of growth and aviation industry competition in the United States comparative to other nations like Germany leading up to and during World War I. The litany of lawsuits undermined the sense of cooperation and common effort needed to make technical advances even as it took away time from the parties involved to develop better aircraft and discouraged companies from undertaking contracts, knowing they would most likely meet litigation. However, the role of the United States government and its attitude toward flight in the years prior to involvement in the war is also an important consideration in understanding the fate of aviation in these early years. There had been a long history of flight research and attempts before the Wrights success in December 1903. Contributors to the body of heavier-than-air flight research were numerous by the nineteenth century. All around the globe, individuals were advancing their own legitimate theories and experimenting with manned flight well before the involvement of the Wright brothers in the field. These pioneers include Sir George Cayley of England, Otto Lilienthal of Germany, and American-based inventors Octave Chanute and Samuel P. Langley, among many others. In the early stages of their research, the Wrights were taking advantage of these established principles; for instance, the Wrights asked for information from the Smithsonian and corresponded with pioneers like Chanute, who would go on to participate (though marginally) with the Wrights in their experimentation. Orville and Wilbur Wright made a significant contribution to this body of knowledge with wing warping. Like many others, the Wrights studied the flight behavior of birds. In doing so, they realized that birds make banking turns by tilting their wings, which had not yet been incorporated in aircraft design. Wing warping allowed for stabilization. The Wrights adopted this method by adding flexible wings to their flyers; the system was connected with the rudder and the pilot would turn by twisting the wings in the appropriate way. With this incorporation, the Wright brothers were able to build a powered aircraft that was finally controllable. The three motions that allow for control of the aircraft are pitch, yaw and roll (illustrated above). The Wright brothers aircraft was the first to recognize and achieve lateral control (roll), accomplished by using wing warping. 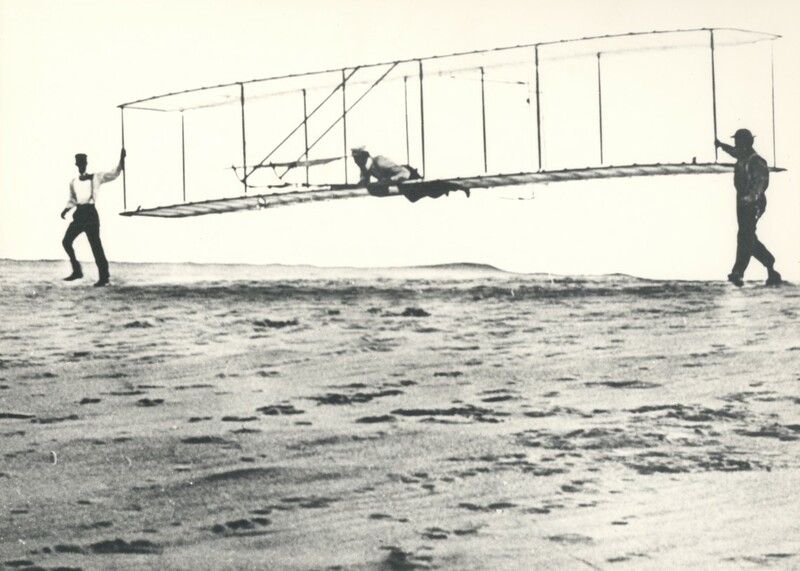 The NASA website explains how the Wright Brothers’ Glider operated. This, while clearly coming from a person biased against the Wrights, does reveal an interesting viewpoint. The Wrights were able to acquire a patent with such a broad reading regarding the wing warping technique that even if someone used a different system to achieve lateral control, he was still likely beholden to the terms of the patent and would have to pay a hefty fee to the Wrights. For instance, when Alexander Graham Bell, Glenn H. Curtiss, and the rest of their team developed the more modern, efficient system of ailerons (wing flaps) in an attempt to bypass the Wright system, they nonetheless found themselves subject to the patent. The courts upheld that it was broad enough to include any system providing for roll. The patent essentially covered something so fundamental to flight that it would have been impossible for anyone working in the field to bypass the brothers rights. To many, it seemed as though the same kind of free exchange of information that Orville and Wilbur Wright had taken advantage of in their early years was being betrayed by this new and deeply proprietary approach. The litigation associated with violations of the Wright patent burdened everyone involved. It was a time consuming and costly process, not only for those sued but also for the Wrights themselves. The Wright family even blamed all the legal battles, specifically those perpetuated by the incessant actions of Curtiss, for Wilburs premature death in 1912. Though Curtiss continued developing his planes during this period (still infringing on the Wright patent), the Wrights were largely consumed with the battles and would personally make no more major contributions to the field of aviation at that point. Their planes remained markedly less modern than most others being produced worldwide. With Wilburs death and the ongoing lawsuits against Curtiss, Orville left the Wright Company by 1915, selling out and limiting his future involvement. Despite the fact that some, like Curtiss, continued to make increasingly improved planes, the fear of lawsuits kept many manufacturers from seeking out contracts to sell their work. The Wrights company sought fees of $1,000 per plane and threatened lawsuits to those who defied the patent. Though the Wrights also had similar patents in European countries, it was much easier for those manufacturers to bypass the consequences of infringement; the lawsuits took much longer to resolve in foreign courts and as such, the patents had a chance of expiring before reaching a settlement. There was a steep disadvantage to the American manufacturer in regards to the Wright patent when compared to the Europeans, who were enjoying more innovation and growth in aviation during this era. In spite of all of this, to place blame squarely on the Wrights themselves is unfair. They had achieved something that fundamentally changed aviation, and achieving it had taken a great deal of work. Having put in the work that made it possible to profitably manufacture powered aircraft, it is understandable that the Wrights were business-minded about their patented invention. It is likely that others involved in the development of the airplane would have taken the sameif not more rigid and severemeasures had they managed to achieve the same results. The Wrights were not forbidding researchers the right to use their discovery; rather, their aim was toward those who were profiting monetarily from what had been deemed legally their own. To get a more full explanation for aviations slow start in the United States, one must also turn to the country itself and the popular view of aviation that existed. The U.S. government had already dabbled in funding flight prior to this time and it had resulted in failure and public embarrassment. Samuel Langley, onetime secretary of the Smithsonian, was one of the pioneers of aviation. His research garnered the interest and support of then-president, William McKinley, leading to $50,000 in funding to further his work. Unfortunately, the fruits of his labor resulted in a craft called the aerodrome that crashed into the Potomac just days before the Wrights achieved the same goal with their aircraft. This unsuccessful craft, the result of a lot of work and just as much money, had an impact on public opinion and left the government wary of investing any more funds in the field of aviation. When the Wrights initially tried to sell their Flyer and its rights to the government, they were refused; if someone as skilled as Langley had not been able to make a functional manned flying craft, it seemed even less likely that these two unknowns could have, especially without proof. Even when American aircraft (however few) were sold before the war, they were primarily being exported to other countries rather than being bought by the U.S. government. In the end it was only when involvement in the First World War loomed and the necessity of aviation as a military tool became apparent by looking across the Atlantic that the U.S. government took control of the situation. They created a patent pool to end the widespread litigation and encourage manufacturers to make and sell aircraft. All relevant patents went into a pool and members of that pool were able to use all these developments in their aircraft without having to pay exorbitant royalties. The patent pool proved a necessity for aviation and other modern industries such as the automotive industry, because it prevented stalemate and allowed for progress. Once this occurred, the growth of aviation was still slow going and manufacture would remain below demand even by wars end; the productive capacity of American manufacturers was not up to par. Only five manufacturers had turned out over 10 airplanes and the largest manufacturer (Curtisss company) could only turn out 1,500 per year at most (the other allied powers were calling for 25,000 from the U.S.). However, appropriations had increased significantly since the height of the patent wars when they had totaled a mere $500,000 over an entire five-year span. There is no doubt that any gains held by the United States in the field of aviation eroded in the years following the success of the Wrights. These brothers deserve credit for their contributions to the field; they proved that man could conquer the air. However, the Wrights took their business savvy to the extreme by being so litigious in the formative years following their great achievement and the granting of their patent. The call for steep royalties proved hindering to many manufacturers and alienated many figures in the field who believed the Wrights were taking their claims too far. Still, the U.S. government allowed this environment to fester for years because it did not understand the importance of air power, especially in regards to armed conflict. It was only after the country was able to see the utility of aircraft in war efforts that the patent situation was resolved through the creation of a patent pool, leading to the (slow) growth of manufacturing. George Bittlingmeyer, Property Rights, Progress, and the Aircraft Patent Agreement. Journal of Law and Economics 31.1, Apr., 1988: 231; Glenn Curtiss and the Wright Patent Battles, U.S. Centennial of Flight Commission, http://www.centennialofflight.gov/essay/Wright_Bros/Patent_Battles/WR12.htm.